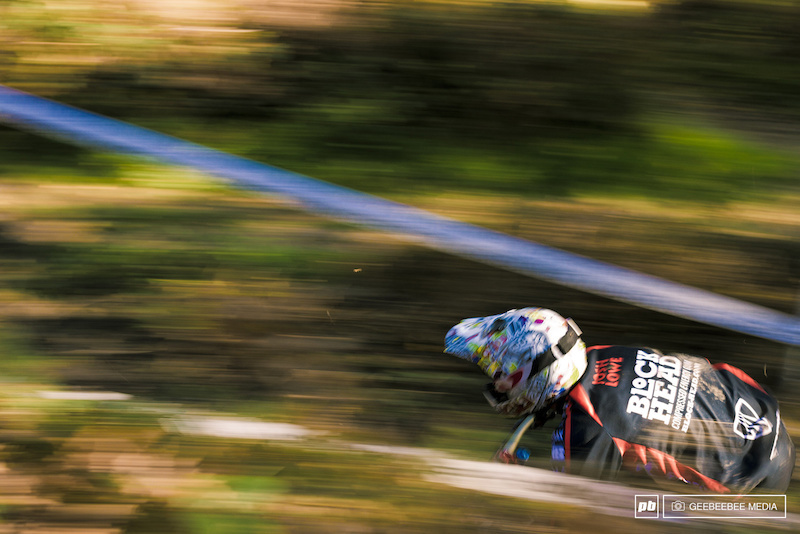 It's been a massive year for grassroots downhill racing in the South East of England. With races pretty much every weekend and many venues running their own home-grown teams and race series, this relatively flat corner of the UK is holding its own in producing great races and has a wealth of new talent, some of whom are just a few steps away from international recognition. The PORC 2013 Downhill Race Series has been one of the most successful and well attended series over the last year in the South East, largely due to the efforts of Mike Joseph and his team, as well as support from a broad range of local, national and international sponsors. The last race of the series, held last weekend, treated riders to yet another new race line (seven different race lines have been used in the seven race series), and as the British autumn weather made sure, the riders were going to be entitled to a complementary Kentish beauty mud-mask! Racers were competing for both the race round win and for points towards the BTR Fabrications-sponsored PORC Series Championship, a new feature for PORC races, which helps to encourage riders to come back race after race for a chance to win not just points and prizes but a hand-crafted trophy thanks to the awesome workmanship of the team behind BTR Fabrications. 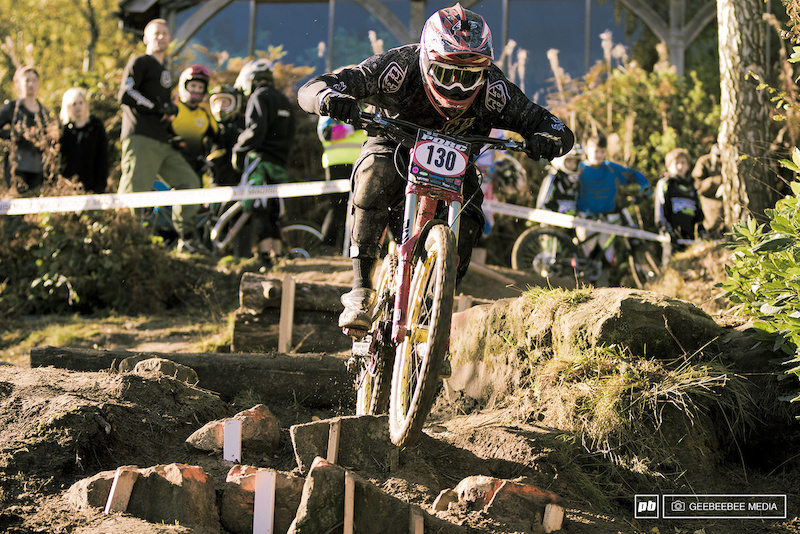 Over 330 riders competed in the race series this year and it's thanks to the track builders and race organisers that riders kept coming back to earn points and experience. 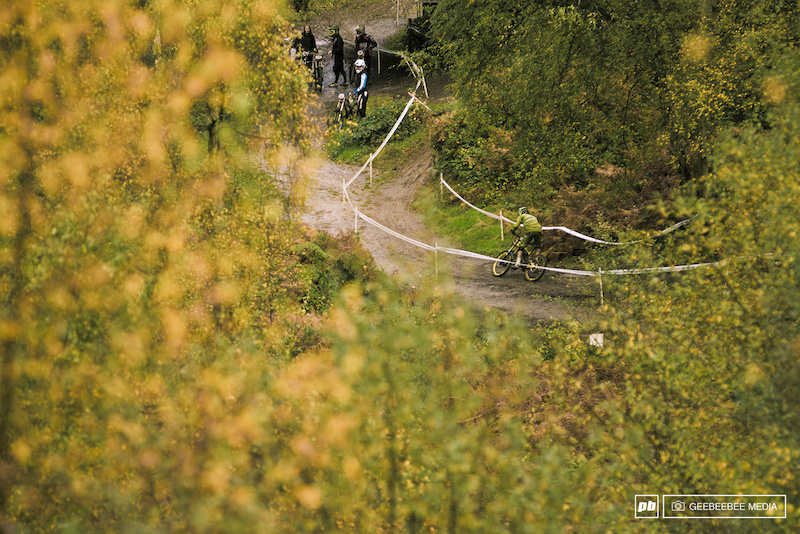 The seventh and final race line was a mixture of flowy jumps in the top section, a substantial rock garden with drops and technical turns in the mid-section and a series of gaps, a root garden and off-camber turns in the last section. Coupled with the saturated dirt from the constant rain over the previous days, riders had to be fit enough to pedal through the tacky sections to maintain their speed through the technical ones. The race line through the rock garden in the mid-section was opened up so riders were given a variety of line options, some requiring more cunning whilst others requiring pure guts. Unfortunately for some, despite managing to get through the rock garden, they came a cropper in the tight and steep left-handed corner soon after. 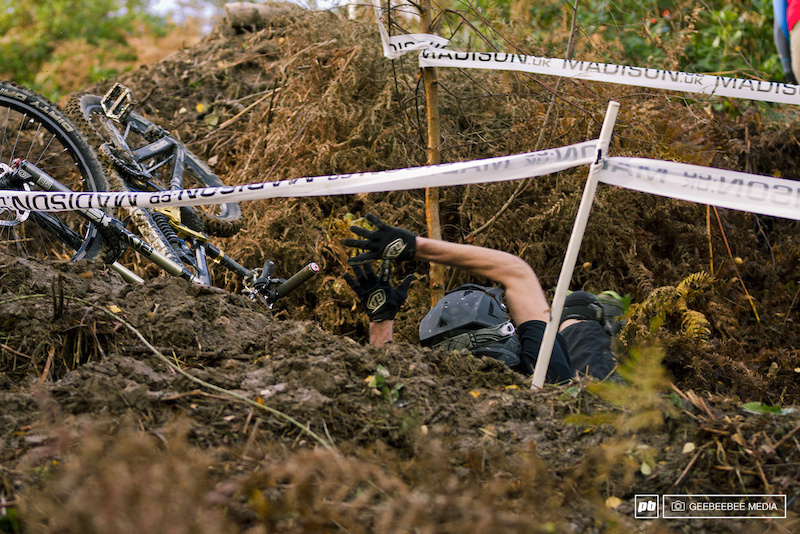 Riders who got this section wrong from the start in the rock garden entry-point, found themselves in the wet bracken outside the tapes! Spectators lined the course at key vantage points and a wealth of photographers positioned themselves around the big jumps sections further down the race line, all keen to see the 90-strong field plough through the mud. 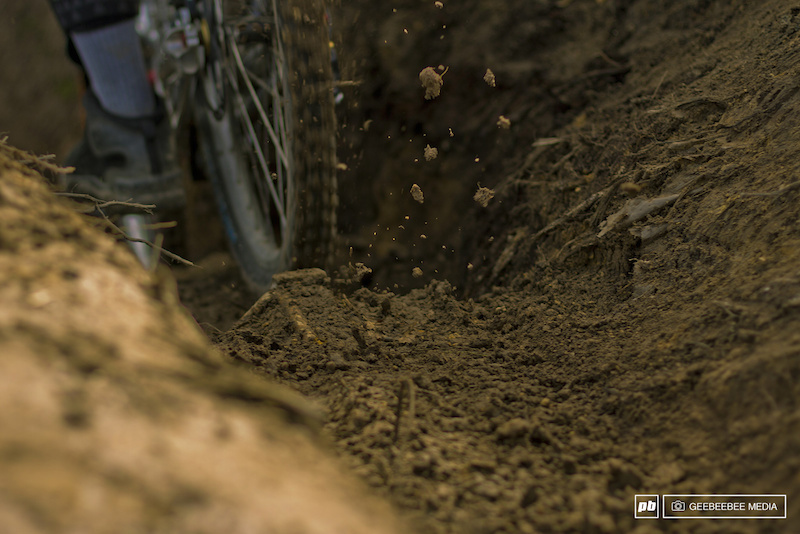 With the track so treacherous, riders struggled to gain the speed required to clear the jumps, so it was down to their skills - and their suspension - to see them safely to the finish line. The usual suspects, Josh Lowe and Glenroy Martin - who both competed in Europe as well as the British National Series this year - were up against fresh competition in the form of French World Cup, iXS, EWS and Crankworx Air DH racer, Ludovic Oget on his Zerode. With less than a second splitting the top three in overall times, all the riders knew that any slight wobble over the slippery mud or huck to flat in the mid or lower section was going to destroy any advantage gained in the top section. The last run of the day was all or nothing for most riders as their previous runs had been scuppered by slide-outs or out-the-front-door moments and to spice things up even more, the heavens opened, which led to rivers flowing down the beaten-up track. With true grit, the riders continued and eventually the clouds moved on, leaving spectators to bask in the afternoon sunshine of the Kent countryside. With the last riders down, the race, the day and the series belonged to local rider Josh Lowe who managed to fend off the threat of losing the last race of the season to the new challenger, narrowly beating him into second position. Thanks to the riders, spectators, medics, marshals and all the sponsors for their unfailing support and making our grassroots racing such a huge success: Downhill Freeriders, BTR Fabrications, Juice Lubes, Whisper Bikes, geebeebee media, Moose Cycles, Hope Tech, Mucky Nutz, Monster Energy UK, Kenny Racing, Madison UK, ii10photo.com, Southcoast Suspension, Drift Cycles, Miles Professional Brake Components, ZAGWAY, High5 Sports Nutrition, MRF Photo&Video, Schwalbe, SHIMANO, DaveHaywardPhotography and MIKROTIME. Full final round results can be found at: Mikrotime. Championship results can be found at: PORC Series Championship. Catch up with PORC via the Facebook page. Thank you dude! All those hours digging and talking to sponsors really showed! I’ve had an amazing first year racing in all the local races. BIG THANKS to everyone involved in setting up the events building awesome tracks and to the photographers for great shot and video’s. So much time effort has been put in. Met some great friends and looking forward 2014! BMXrad just created this profile to make that comment! Grow some!!!!! Who are you the troll hunter ! As I say PORC is good but why have a dig at the other race organisers who work very hard to put on races. Nope just thought it’s a bit off to make a comment like under a temp profile! Anyway..... onward an upwards let’s just enjoy what we do! Yes Macaullay! You beast mate. Well done Mike. You have turned PORT into a gem. 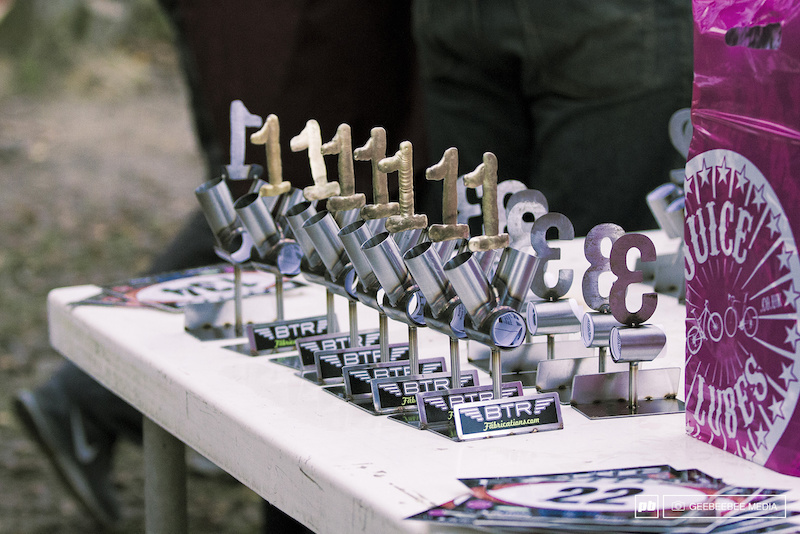 Have you decided when the first race of 2014 will take place? Porc is good but theres no need for this dig is there? That's not a dig really but look at what they (PORC) offer. New track every round, warm foods, toilets, uplift.......... come on dude, that's a big jump from other series. When promoting a product NEVER slag other products it make you look BAD just talk about what your product is good at!! The bulltrack.. if so then I slagged myself off as I help organised those for the last two seasons... the gravity project? I wouldnt be there main sponsor if I thought it was crap? What it should have meant is the scene is being stepped up? But apologies if I somehow offended you..